Our world-class laser and light therapies are fast, affordable and incredibly effective. Three different facials provide targeted, bespoke treatment that transforms skin instantly. If you’re looking for quick rejuvenation that helps you go from Bodyvie to the red carpet, these laser facials are the way to go. Great for patients with acne, large pores, poor skin quality, melasma, redness and pigmentation. No downtime, just results. Facial suitability will be determined during your consultation and will require a patch test prior to full treatment. The Hollywood facial is the ultimate synchronisation of both Laser, Light and Carbon (combined Q-Switched YAG, Carbon Paste & IPL) for flawless celebrity skin. 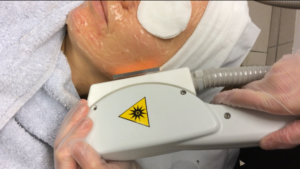 Firstly, one pass of quality-switched (Q-Switched Nd:YAG) laser creates high-intensity pulsed beam light which uses heat to destroy unwanted pigmented lesions. Q-Switched laser bursts pigmentation into extremely small absorbable fragments, stimulates collagen and kills problematic bacteria. One pass is enough to target age spots, sun spots as well as post-inflammatory hyper-pigmentation from past acne spots. Secondly, a layer of organic carbon powder is applied to the face. This carbon paste absorbs dirt from within the pores and exfoliates. Once the paste has been applied, the laser is again passed over the skin. In this third step, the laser then breaks down the carbon paste, taking with it any contaminants that it has absorbed. As this is a thermal treatment, the heat produced from the destruction of the carbon also has the added benefit of stimulating collagen, plumping fine lines and leaves skin glowing. Lastly, IPL (Intense Pulse Light) is passed over the skin which targets pigment further as well as treating prominent thread veins and redness caused by rosacea. This wavelength is easily absorbed by the blood in veins and superficial pigment which causes veins to breakup into smaller particles which are easily filtered away. IPL also has an antibacterial effect on acne by heating up surrounding tissue and stimulating the body’s natural healing process. The overall effect leaves skin, clean, refreshed, brighter and glowing. The perfect primer before any big event. QUANTA Q-PLUS C EVO Laser is one of the safest and most advanced laser treatments available. Prior to your treatment, you will have an in-depth consultation with your Bodyvie consultant to discuss your requirements. Your therapist will conduct a patch test a minimum of 24 hours prior to full treatment to ensure that your skin will respond favourably to the laser. Each tailored treatment may vary from one person to another and may include multiple platforms. Bodyvie’s Hollywood Facial is only appropriate for patients with skin types I-III.